Broadway Palm Dinner Theatre offers direct Broadway and New York-quality stage performances (Chicago pictured) with the option of a c hef's meal, a true experience. Photo courtesy of Broadway Palm Dinner Theatre. 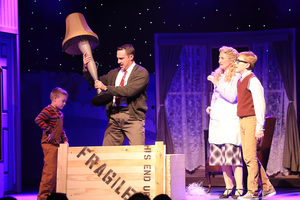 This year's performance season includes classic shows such as A Christmas Story. Photo courtesy of Broadway Palm Dinner Theatre. Bill Clinton was president then and “Earring Magic Ken” was Barbie’s new best friend. But 25 years ago the landmark impact in Southwest Florida was the Prather family converting a closed grocery store into the Broadway Palm Dinner Theatre. The venue in 25 seasons has entertained at least a million of us, has introduced kids to performance art, has made holidays and special events memorable, has opened the door to promising actors and to back-stage crews, today is the centerpiece of the revitalized Royal Palm Square retail district in Fort Myers. Starting in September, Broadway Palm this season will run eight mainstage productions, five productions in The Off Broadway Palm, four Children’s Theatre productions, five concerts and three special engagements. The season opens Sept. 7 with Groovin: The 60s and 70s Musical, stages the musical Pippin in October and the holiday classic A Christmas Story starting in late November. This year's performance season includes classic shows such as Pippin. Photo courtesy of Broadway Palm Dinner Theatre. Opening in the 1993 season, Broadway Palm’s first staged productions were Me and My Girl and Babes in Toyland. Broadway Palm’s mainstage opens Sept. 7 and runs through August 2018. Show prices range from $45 to $70, with group and children’s pricing. Performances are Tuesday through Sunday evenings (no Tuesday evening performances May through October) with selected matinees. Along with Groovin: The 60s and 70s Musical, Pippin and A Christmas Story, mainstage productions will include Chicago (Dec. 30- Feb. 10, 2018), Mamma Mia (Feb. 15-April 7), My Fair Lady (April 12-May 19), Ring of Fire (May 24-June 23) and Annie (June 28- Aug. 11). Check broadwaypalm.com for other shows, art exhibits, children’s theater, musical performances and pricing.